By the time I became interested in folk music, Planxty had already disbanded. As related in Week 194 – As I roved out, it was a school friend Pete Carlton who first introduced me to the band and, of course, I thought they were wonderful. It was thus with great delight that I discovered from an advert in Melody Maker that Planxty were playing a comeback gig at the Hammersmith Odeon on Easter Sunday 1979. Alan Greenwood, one of the Oyster Morris musicians, gave a lift to me and Dixie Fletcher, organiser of the Duke’s Folk club in Whitstable. I must admit, I don’t specifically remember them playing ‘Rambling Boys of Pleasure’ that night, but I’m pretty sure they would have done – it was probably the same setlist as captured on the recently released (and highly recommended) One Night In Bremen, recorded a bit later on the same tour. The song first grabbed my attention on the new LP After the break recorded at the end of the tour, and released later the same year. For me, this was the stand-out track, and I can’t really explain why I never got round to learning it. But maybe that was as well, as it left me open to explore other versions of the song. 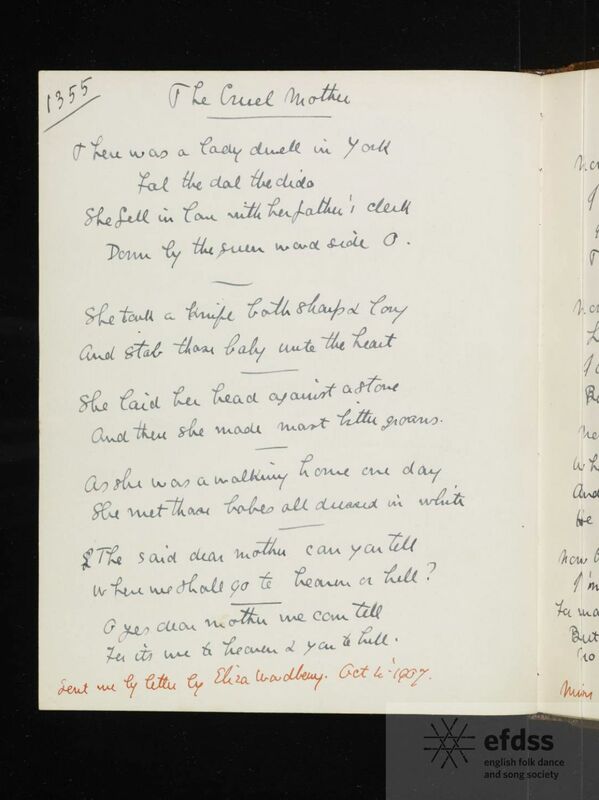 Some 10 or 15 years ago, leafing through the bound volumes of Cecil Sharp’s Folk Tunes in the Vaughan William memorial Library, I came across a song called ‘The Rambling Beauty’. Looking up other versions in the catalogue led me to Frank Purslow’s book The Foggy Dew (now included along with Purslow’s The Constant Lovers in the excellent Southern Harvest). And then I noticed, on the next page a version of this song collected by George Gardiner from David Marlow at Basingstoke, and I took a photocopy to add to my big pile of songs I probably should do something with one day. Last year when I finally sat down to piece together a version to learn, I decided to base it, not on David Marlow’s version but on this version collected by Cecil Sharp from William Stokes, at Chew Stoke, Somerset on 11 Jan 1907. Ye roving lads of pleasure, collected from William Stokes. From the VWML archive. I’ve collated the words from these two sources, with the broadside version shown below. This was printed by G. Jacques, Oldham Road Library, Manchester, and can be found on the Bodelian’s Broadside Ballads Online website. The rambling boys of pleasure, from Broadside Ballads Online. Note that on this broadside version it’s “Down by yon valley gardens”. On some others it’s “down by Sally’s Gardens”, and earlier printings don’t have that verse at all. Steve Gardham’s notes to the song in Southern Harvest suggest it started as two entirely separate songs, which were combined in Northern English printings at some time before 1850. You can check out all of the versions in the Bodlein’s online collection at http://ballads.bodleian.ox.ac.uk/search/roud/386. Another week, another lady living in the North country, and once again things do not end well for her. This, of course, is much less to do with the fact that she lives in the North, than that she finds herself a character in a Child Ballad – and not many of those have a happy ending. This very concise version of what is usually a much longer ballad was collected by Cecil Sharp from Mrs Eliza Woodberry of Ash Priors in Somerset (also the source of the version of ‘Come all you worthy Christian men’ in the Oxford Book of Carols). Sharp included it in his Folk Songs from Somerset, Series 4, and Sharp’s tireless assistant and evangelist Maud Karpeles printed it in her 2-volume collection, The Crystal Spring, which is where I learned it. The Cruel Mother, as collected from Mrs Eliza Woodberry, from the Full English. 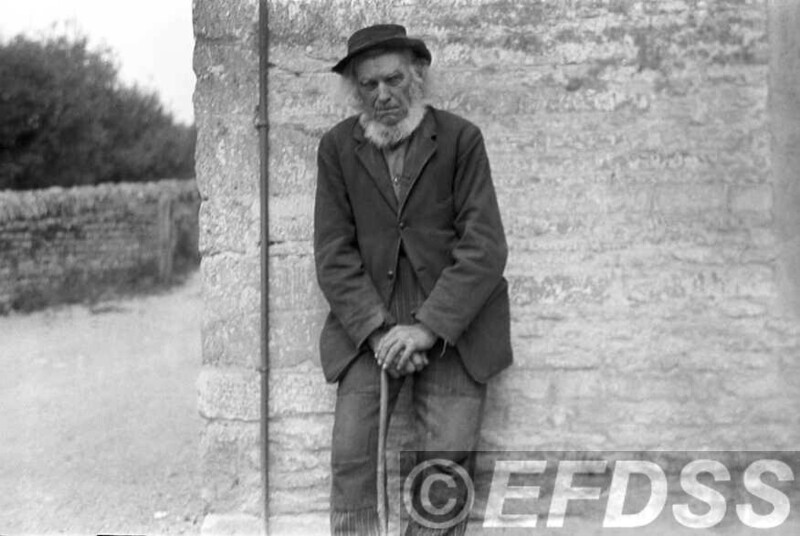 Shepherd Haden might be the best known traditional singer from Bampton (see last week’s entry), but both Cecil Sharp and Alfred Williams, who noted down songs from Hayden, also collected songs from his younger neighbour, and Bampton morris man, Charlie Tanner. You will find biographical details on Charles Tanner (1845-1922), drawn from census and other records, on the Wiltshire Community History website (it was from here that I learned that in 1891 Tanner was living next door to Shadrach Haden / Hayden / Haydon). On the same site, you’ll find a list of 23 songs collected from Mr Tanner by the Swindon railwayman poet, Alfred Williams. 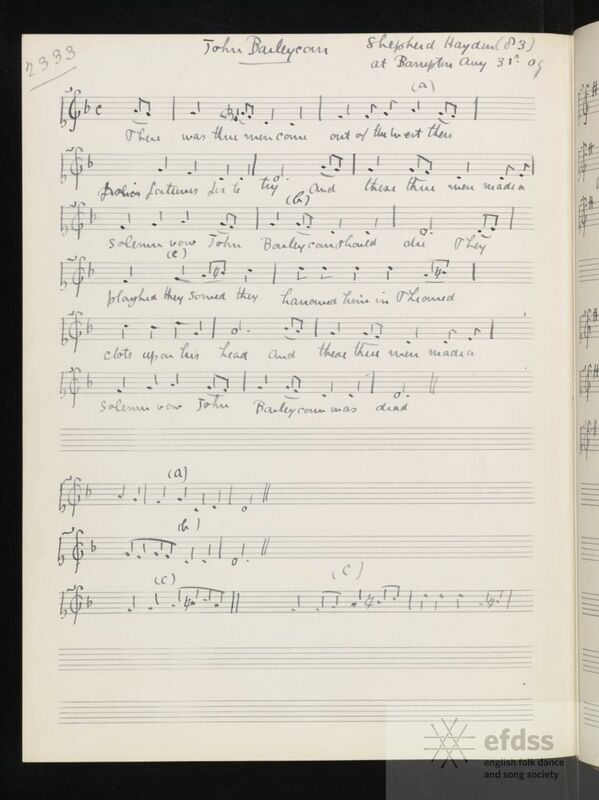 Williams, of course, lacked the skills to notate his singers’ tunes, and unfortunately Sharp only took down the tunes for eight of these songs (see the Full English). Sharp noted ‘Chain of Gold’ on 7th September 1909. Williams visited Tanner in the following decade, and the words of this song appeared in the Wilts and Gloucestershire Standard on 11th March 1916. Versions of this song – a classic example of a sad story set to a jolly tune – seems to have been popular in Oxfordshire: George Butterworth collected versions at Stanton St John, Charlton and Oakley in Oxfordshire, and at Brill just over the border in Buckinghamshire. The words I sing were collated from Tanner’s version, and others printed in the Journal of the Folk-Song Society Vol. 4 (1913). This is the second version of ‘John Barleycorn’ to appear on this blog. I posted a Shropshire version back in Week 61, and there’s also the – largely unrelated – ‘John Barleycorn’s a Hero Bold’. I’ve also recorded a third version – collected from Charlie Hill of Devon in the 1970s – on the Magpie Lane CD A Taste of Ale. That CD can still be purchased from our website (so don’t pay £34 for it from Amazon! ), or downloaded from Amazon, iTunes etc. etc. (I notice on Amazon we are described as “Oxfordshire folk supergroup” – not sure we’re quite in the Traveling Wilburys league). Ian and I sang this version of the song on the first Magpie Lane CD, The Oxford Ramble, back in 1993, and I suppose we’d better revive it for the ‘Songs from Bampton’ session we’re running at the English Country Music Weekend at the end of this month. It’s the best-known version – indeed I’d say it’s one of the best known English folk songs, thanks to the fact that it was included in the Penguin Book of English Folk Songs, and to recordings by Mike Waterson, Martin Carthy, Traffic, Chris Wood… and Martin Carthy again, with Paul Weller of all the unlikely people, on the first Imagined Village album. 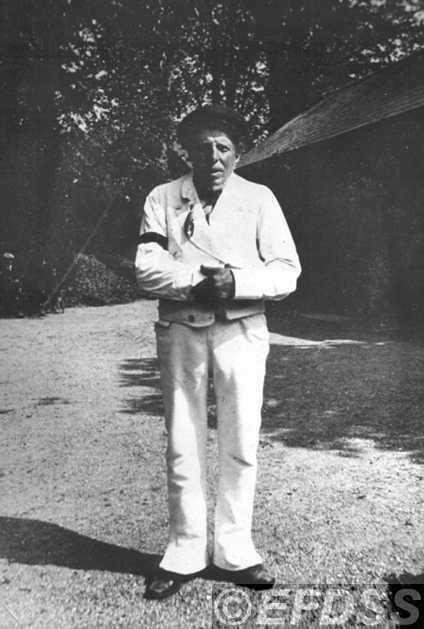 Believed to be a photograph of Shepherd Hayden, taken by Cecil Sharp. Copyright EFDSS. Cecil Sharp noted the song at Bampton in Oxfordshire, on 31st August 1909, from the eighty-three year old Shadrach ‘Shepherd’ Haden. John Barleycorn, collected by Cecil Sharp from Shepherd Hayden (or Haden); from the Full English. It was perhaps inevitable that this song would attract the ritual-origins theorists who claimed that it was all to do with corn spirits and resurrection, but it is now generally agreed that such notions were romantic wishful thinking and there is no evidence either for the theories themselves or for this song to be anything other than a clever allegory. And I’ll go along with that. Long live Occam’s Razor. And here’s Ian Giles and me singing the song at the very first Magpie Lane gig, Holywell Music Room, May 1993. Surprisingly, I have so far posted only one other version of ‘While Shepherds Watched Their Flocks By Night’ on this blog – Sweet Chiming Bells. I was convinced I had also posted a recording of Magpie Lane singing ‘Foster’, but checking the site index I find that it’s not so. This will have to be rectified (actually, it is the first song in our Magpie Lane Christmas playlist which I shared here a week or so ago, but that doesn’t count!). It would be nice at some point also to be able to post recordings of ‘Otford’, ‘Lyngham’ and, probably my favourite setting of them all, William Knapp’s wonderful ‘The Song of the Angels, at the Nativity of our Blessed Saviour’. And that still would still be no more than scratching the surface of all the great settings of these words from West Gallery sources, and from the living carolling traditions of South Yorkshire, Derbyshire and Cornwall. The words of ‘While Shepherds Watched’ – properly, as Knapp titled it, ‘Song of the Angels at the Nativity of our Blessed Saviour’ – were written by Nahum Tate (1652-1715), poet laureate to William of Orange. The ubiquity of the words owes much to the fact that the six, easily-remembered verses were included immediately after the metrical Psalms in the Book of Common Prayer. Browsing through the Full English a few weeks back, for carols collected in Oxfordshire, I came across this one. Shepherds Watch, collected by Cecil Sharp from Charles Benfield, 4th September 1909. From the Full English. 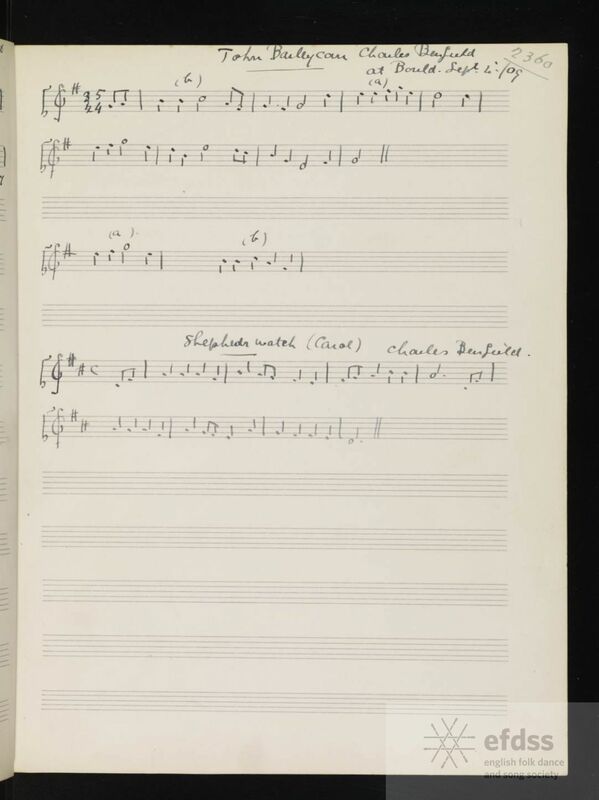 The simple tune was noted by Cecil Sharp on 4th September 1909 from Charles Benfield of Bould in Oxfordshire. 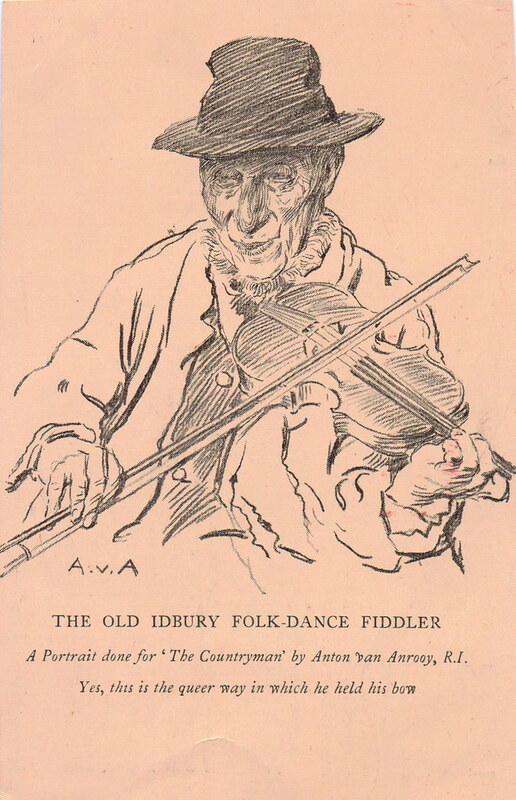 Mr Benfield (1841-1929) is better known as a morris musician – he played both pipe and tabor and fiddle, for morris sides including Bledington,Fifield, Idbury, Longborough and Milton-under-Wychwood. A drawing of Charles Benfield, and the “queer way he held his bow”. This is a scan of a postcard from my parents’ collection. The illustration was also used as the frontispiece in the first issue of the Countryman magazine. Check out the back of the postcard too. I learned this song from Maud Karpeles’ book, The Crystal Spring Volume 2, a copy of which I received as an eighteenth birthday gift from Cathy Lesurf and Will Ward. 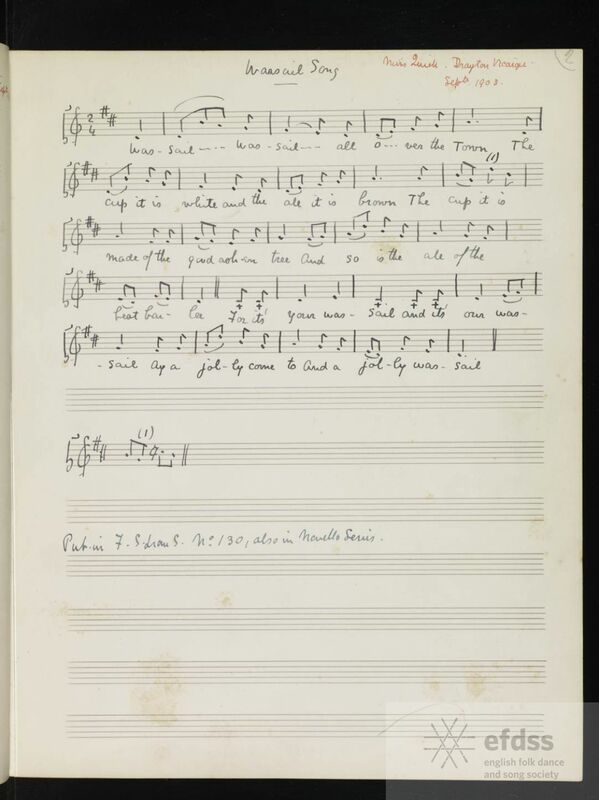 The song was just one of a number of good pieces collected by Cecil Sharp from the inmates of Marylebone Workhouse. This one was sung to him by William Atkinson on 19th October 1908. Mr. Atkinson was born in York and plied his trade of silversmith in Sheffield and London. He learned this song from a shop-mate, Mr. Frank Habershon, a native of Sheffield, who regarded the song as a “family relic.” Mr. Habershon learned it from his father, who, in turn, had had it from his father. The song was always sung at weddings and other important family gatherings. – no doubt because it’s such a cheerful piece! It is possible that “Wo-burn,” which is in a neighbourhood where “woe-waters” suddenly flow – to the alarm of the superstitious – may have given rise to the idea that a bursting forth of a “woe-burn” was prophetic of disaster to the Duke of Bedford’s family. The distinguished member of the family to whom I submitted the ballad cannot connect the story or the superstition with any of his kin. Indeed, she concludes that the song as collected may be the combination of two separate ballads, and that the original had nothing to do with any historical Duke of Bedford. Various other nobles have been suggested, but on this Mudcat thread ballad expert Bruce Olson says quite categorically that “This is a traditional version of a broadside ballad on the death of the Duke of Grafton (son of Charles II and Barbara Villers) killed while storming Cork in 1690”. As so often, the same thread has a really valuable contribution by Malcolm Douglas, summarising the various versions, early ballad sources, and linking to sources of further information. When I first learned this, as an impatient youth, I thought the simple 8-bar melody somewhat repetitive, and added a second strain. I’ve retained that, but just in verses 4, 8 and 10. A few years ago I came across this song while browsing through the copy of Cecil Sharp’s Folk Words in the Vaughan Williams Memorial Library. I was pleased to see that Sharp had collected a couple of verses omitted from The Crystal Spring. And the twang of bow string. I suspect that the earlier stanzas are traditional but that the concluding four were either added by some member of the Habershon family or derived from a broadside of recent date. the stamp of the early nineteenth century is on their matter and phraseology, and they are full of absurd anachronisms. Six Dukes, as collected from William Atkinson. 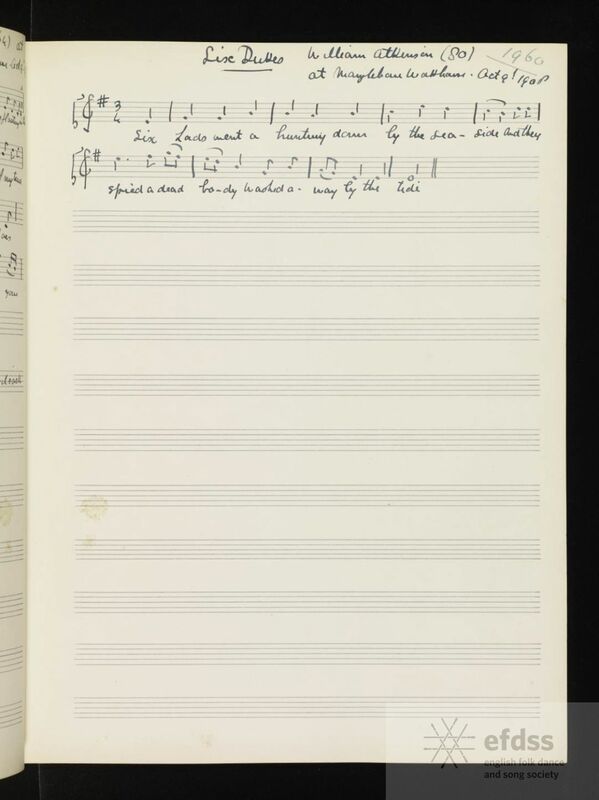 Cecil Sharp’s ‘Folk Tunes’ via the Full English archive. By no means the only Wassail song to have been collected in Somerset, once included in the Oxford Book of Carols this became for evermore The Somerset Wassail (cf. the Gloucestershire Wassail and the Sussex Carol). The notes in the book say that the song was noted by Cecil Sharp “about twenty years ago” (September 1903 in fact) from the Drayton Wassailers in Somerset. Actually he collected several other versions in the county where the words included either the verse about a farmer who didn’t know how to look after his cow (more cider is the answer!) and/or the verse about the “Girt Dog of Langport”. Wassail Song, noted by Cecil Sharp from Miss Quick, Drayton, Somerset. From the Full English archive. In fact, this Danish raid may be mere legend, as it seems that the Vikings never penetrated that far into the West Country. Their attempted invasion began on Christmas Day 877, when Guthrum’s surprise attack on Chippenham drove Alfred into the marshes of west Somerset. Alfred set up a base at Athelney (the Island of the Nobles) a few miles west of Langport, and immediately began organising his counter-attack. In 878 he defeated Guthrum at Edington (the Anglo Saxon Chronicle identifies the Edington near the Westbury White Horse, although there is a theory that it was the Edington by the Polden Hills near Glastonbury). It was the resulting treaty between Alfred and Guthrum which divided England into the Anglo Saxon kingdom and the Danelaw. I think the only Danish attack on the West Country was by the force which arrived at the mouth of the Parrett and was wiped out at Cannington. If they had got any further, they would have come up against Alfred himself at Athelney. That same Mudcat page puts forwards – and debunks – a number of theories. Bear in mind when considering them that King Alfred was an actual historical character, unlike another King whose name begins with A, and who is supposed to have associations with this part of the country. Drayton is only 15 miles from Glastonbury Tor, and the danger of infection by romantic New Age twaddle is consequently very high. We recorded this on the Magpie Lane album Wassail and the song pops back into our Christmas repertoire every two or three years. We sang it again this Christmas, but I foolishly neglected to get a recording. So, rather than wait another twelve months, here it is with a hastily-concocted concertina part. The Unfortunate Lad, broadside printed by Such between 1863 and 1885, from the Bodleian collection. The very first version I heard would have been ‘When I was on Horseback’, on the Steeleye Span album Ten Man Mop. That version, recorded in the 1950s from Irish tinker Mary Doran, is rather minimalist: if you don’t already know the story it’s hard to work out exactly what’s going on (incidentally you can hear Mary Doran’s stunning version on the recently-released Topic CD set The Flax in Bloom). A bit later I came across ‘St James’ Infirmary’ in the Penguin Book of American Folk Songs edited by Alan Lomax. It’s a song I’ve always meant to learn, but never have (although I can play the chords on the ukulele). Then I heard another version, in the shape of ‘The Bad Girl’ on Fiddler’s Dram’s eponymous post-‘Bangor’ LP (it’s actually one of several pretty good tracks on the album). I don’t suppose I connected these songs at the time; that realisation came later (and, later still, the history and evolution of the song was covered in some depth by David Atkinson in the first of the EFDSS’s short-lived Root & Branch series). I had planned for many years to learn Harry Upton’s ‘Royal Albion’ (or possibly Alf Wildman’s similar ‘The Banks of the Clyde’) but again never got round to it. Then I came across this version, and very soon realised it was a song I had to learn – especially when I found I could sing it in D minor, and it just fits like a dream on the C/G anglo. The tune was collected by Cecil Sharp from Shadrack ‘Shepherd’ Haden, at Bampton in Oxfordshire. It is printed, along with two others, in the Journal of the Folk-Song Society number 17, in 1913. Sharp does not seem to have collected more than the first verse from Shepherd Haden; the five verses given in the Journal were noted by Francis Jekyll at East Meon in Hampshire (the singer’s name is not given). I put together a composite set of words from various sources, including the Hampshire version – which is also the version included in the Penguin Book of English Folk Songs. “Sailor Cut Down In His Prime” collected from Shepherd Haden 21 Aug 1909, from the EFDSS Full English archive. Although I’ve been singing this for a few years now, I’ve not actually performed it in public that often, and the accompaniment is still quite fluid: I recorded it three times for this blog, and played the ending differently each time. Still not sure which one I prefer, so if you see me singing this at a gig, it might have changed again. Here’s a very first outing for a song which I’ve only just learned. 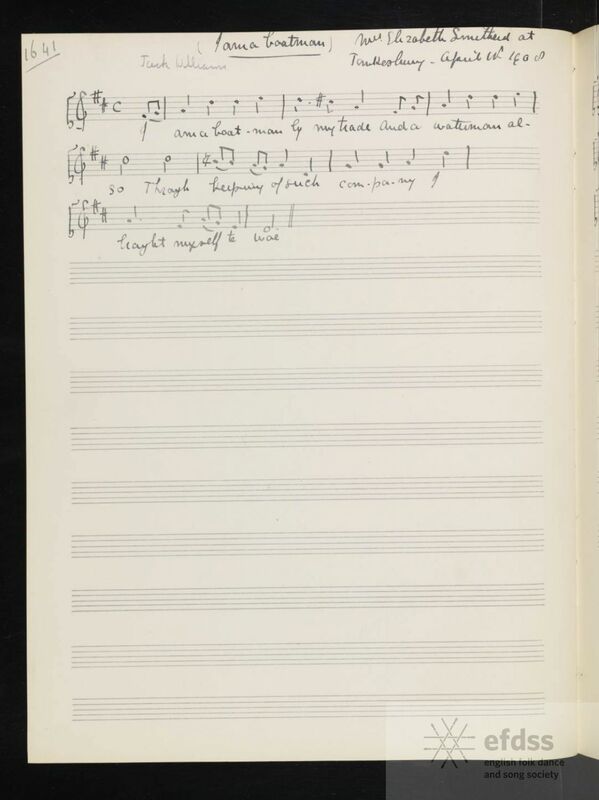 I discovered it a few years ago on a visit to the Vaughan Williams Memorial Library, leafing through the bound volumes of Cecil Sharp’s Folk Tunes and Folk Words. I think I first came across the song as noted from Harry Richards of Curry Rivel in Somerset, then sought out a fuller version, which led me to this version, from Mrs Elizabeth Smitherd (or is it Smilhard?) of Tewkesbury. I am a boatman, noted by Cecil Sharp from Mrs Elizabeth Smitherd, Tewkesbury, 11 Apr 1908. Image copyright EFDSS. I have collated Mrs Smitherd’s words with texts from several sources – broadside printings from the Bodleian’s collection (such as the one shown below), and North American versions including one from Ballads and sea songs from Nova Scotia by William Roy Mackenzie, the words of which are reproduced on this Mudcat thread. A bit further down that same thread, Malcolm Douglas says “The song had reached America by at least 1835, when it appeared in The Forget Me Not Songster, between The Rambling Soldier and Canada I O.” And you can now see that version (in an 1840 printing) online, courtesy of the Internet Archive. You can find several broadside versions of the song at Ballads Online and in the Full English archive. Jack Williams, the boatman, from the Bodleian Broadside collection, Printed by J.K. Pollock, North Shields, between 1815 and 1855. As for the oral tradition, the Full English site has three versions collected in the early twentieth century by Sharp, one by Alfred Williams and one by George Butterworth, all from Southern England. Most versions have a happy ending, but I just don’t buy that. No convincing explanation is given as to how Jack Williams manages to break free from prison, just “and then I escaped”. So in my version, I’m afraid, he is left not only complaining about his perfidious lover, but contemplating an unhappy fate.